IT Operations has reached a tipping point. In the quest to watch over the application landscape, to ensure operational integrity and intervene as early as possible when problems occur, the complexity of the environment has surpassed the ability of humans to monitor it. The status quo, in terms of techniques and technology, is simply not adequate to enable IT to manage these hyper-scale environments. There is too much burden on the human operator. 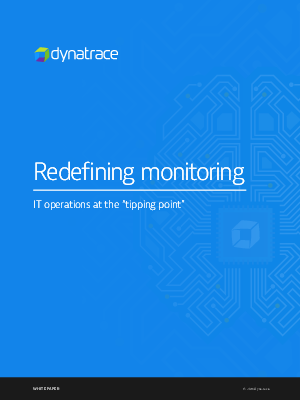 Recognizing this, Dynatrace has completely redefined monitoring with a fundamentally new approach based on Artificial Intelligence (A.I.). Other vendors claim to embed advanced IT Operations Analytics (ITOA) and even A.I. in their monitoring tools. This describes how Dynatrace’s approach is different, and significantly advanced. It is not a vision – it’s live. And it is changing the way organizations monitor their business-critical applications.